Whose Story Would You Rather Believe? With the intimate associations of Christmas to home and family, comfort and security, Christmas Eve is not always seen as an evangelical opportunity. And this may not be the best time to pressure people into making a personal commitment for Christ. Yet Christmas is a crucial time when we can choose whose story to listen to, whose story to believe. One story blares on Caesar’s Network News. This story shows the Emperor literally ruling over the world. Images of Caesar and Roman gods fill every city, proclaiming “Caesar is Lord.” This story reinforces the message that you had best submit, in order to enjoy the blessings of Roman-imposed peace. Significance and value are defined by how you fit into the Imperial story. In this story, Joseph and Mary were a flyspeck among countless conquered peoples, their role simply to pay tribute and glorify Rome. 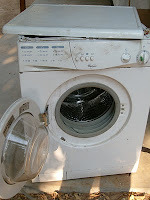 "Unbalanced Load Error" blinks at us from the washing machine, which does not work well now, despite the Frequently Asked Questions online, and the Knowledge Database. Someone will need to arrive with the ability to repair it, soon. with an unbalanced load error. take from us and destroy.